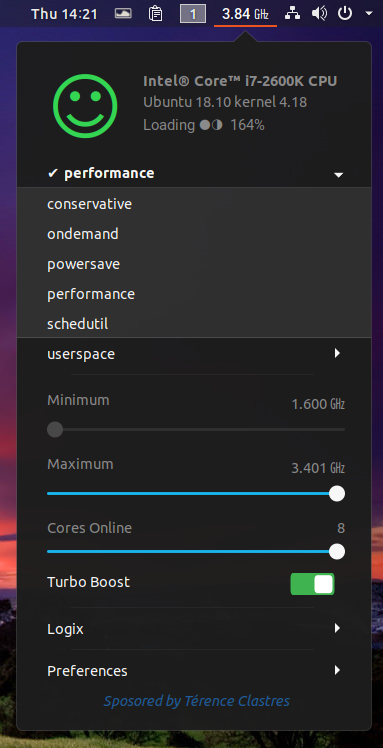 CPUFREQ Power Manager (or just CPUFREQ) is a Gnome Shell extension that makes it easy change the CPU governor (powersave / performance) and monitor the CPU frequency. The extension can also set the minimum and maximum CPU frequency, enable or disable turbo boost, and display some system status messages which can inform the user when CPU throttling is occurring, or when there are some CPU load issues. Another nice feature is custom profiles. This allows the creation of custom power profiles to quickly switch between various application settings. 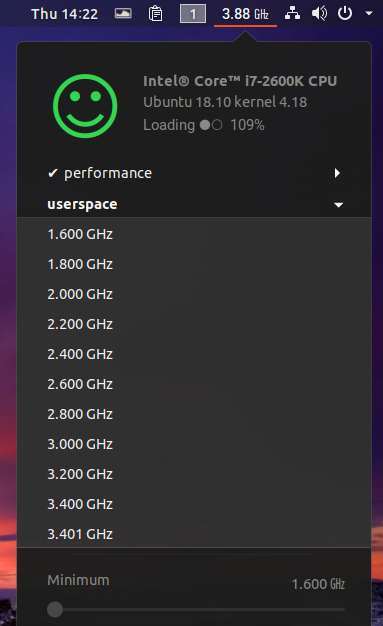 From the CPUFREQ Power Manager settings you can set it to remember the settings, automatically restoring them on the next start (with this set to off being the default), or change what the panel label/icon monitors - the CPU frequency (showing the current CPU frequency value), the CPU governor (showing an icon representing the in-use governor), or both. The extension works with both the CPU frequency driver (CPUFreq), as well as the Intel P-State driver. CPUFreq supports multiple governors (performance, powersave, ondemand, conservative, schedutil and userspace), while the intel_pstate driver only supports the performance and powersave guvernors, but they both provide dynamic scaling. According to Phoronix, the intel_pstate performance governor should give better power saving than the old ondemand governor. Since intel_pstate is used automatically for Intel Sandy Bridge and newer CPUs, it's best to use this. But CPUFREQ Power Manager does support the old CPUFreq driver, which can be used by disabling Intel Pstate as explained on the extension FAQ, and by installing (see the dependencies section from the linked page) an optional package. 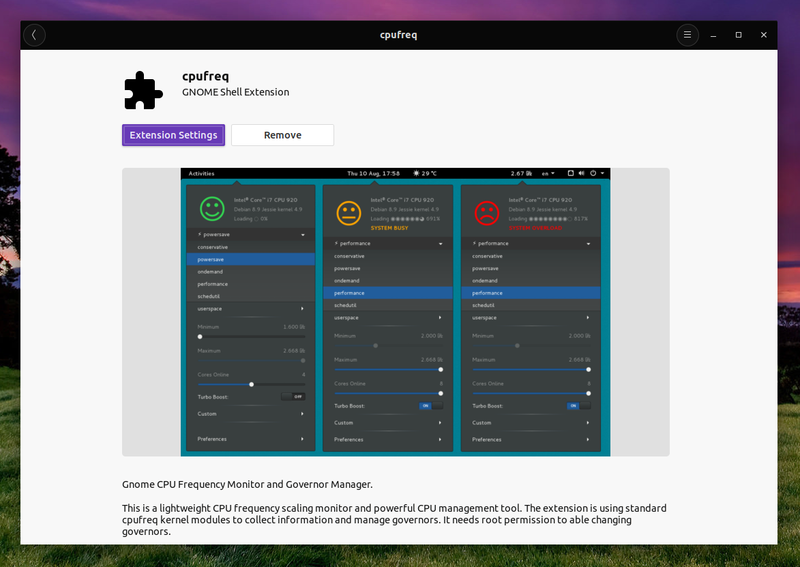 CPUFREQ Power Manager is only available as a Gnome Shell extension right now, but the plan is to create a dedicated Gtk+ 3 application that supports multiple desktop environments. Unfortunately that's not a lot of information about this. To understand what each item in the CPUFREQ Power Manager extension user interface does, I recommend visiting its frontend overview page. The extension FAQ page also has some important information. To install the extension simply switch the slider from the extension page to ON. To be able to install extensions from extensions.gnome.org you'll need a browser add-on and install a package on your system. See this page for instructions. 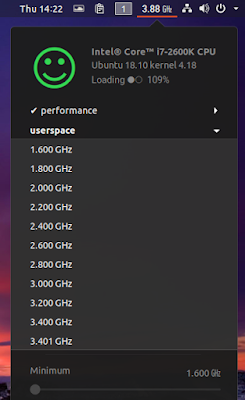 You can also install the extension using the Software application on some systems, by searching for and installing cpufreq, as seen in the screenshot above.